The Dearborn River begins in the Scapegoat Wilderness, part of the Bob Marshall Wilderness Complex, and flows for more than sixty miles to the confluence with the Missouri River near Craig, MT. The Dearborn River initially flows through rugged, mountainous, terrain, before spilling out onto the plains along the Rocky Mountain Front. The Dearborn River has two distinct sections, an upper and a lower. The upper stretch of the Dearborn River lies in mountainous, isolated country. After the Dearborn reaches the prairie, the river flattens out with only pockets of whitewater. In this lower section, which begins at the Highway 434 Bridge, river access is difficult as the river primarily flows through private property. The upper section of the Dearborn River (the upper twenty miles) offers lots of action for small to moderate sized rainbow and cutthroat trout, averaging around ten-inches. Since the upper stretch of the Dearborn River is located in the wilderness, access is by foot or horse only. As this is a mountain stream, numerous pools, riffles and rapids are found all along this stretch. Fishing pressure is extremely low since the lack of road access keeps the vast majority of anglers away. A fairly heavily used hiking trail parallels the river, allowing for excellent access for anglers willing to venture off the roads. The lower section of the Dearborn River begins at the Highway 434 Bridge, and extends for forty miles downstream to the Missouri River. Only a handful of access sites exist along the Dearborn River in the lower section. As such, the Dearborn River is best floated. Since the lower section of the river can become very low by mid to late summer, floating is best done during late spring and early summer. During the early season, a stonefly hatch occurs on this section of river, offering excellent dry fly fishing using various stonefly imitations. 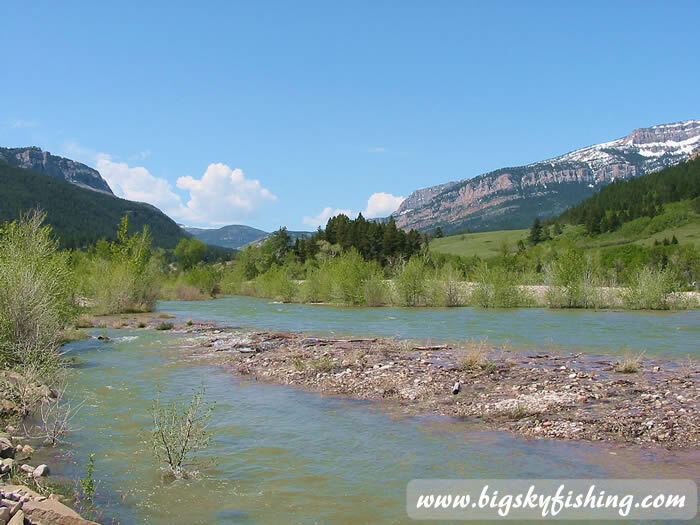 Beginning in May and June, the Dearborn River offers decent dry fly fishing using standard caddis and mayfly imitations, such as the Elk Hair Caddis and Parachute Adams. 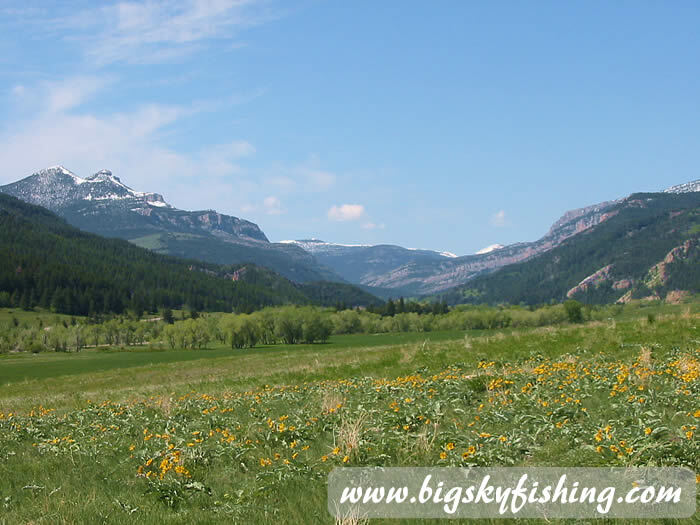 Additionally, on the lower portion of this stretch, large streamers fished around the holes and undercut banks can pull out larger brown trout exceeding sixteen-inches. Fishing pressure is very low on the lower stretch of the Dearborn River, due to difficult access and its close proximity to other well-known rivers. Fishing pressure will be heaviest around the few access sites. For the wade angler, a short hike up or downstream from the access sites will allow fishing in solitude and in waters that receive low to non-existent fishing pressure. Floating the Dearborn River between the Highway 434 Bridge and the Highway 200 Bridge can provide an interesting float, since there are several whitewater sections and one waterfall. This section of the Dearborn River is generally floated by experienced paddlers in high quality rafts and kayaks. Due to the whitewater and the difficult raft access at the Highway 434 Bridge, better floating conditions on the river are found between the Highway 200 Access Bridge (Highway 200 crosses the river on and the Southern Rocky Mountain Front Scenic Byway) and Highway 287 Bridge. This stretch of the river can be floated by anyone since there is no whitewater, although one small drop is found three miles below the Highway 434 Bridge that inexperienced paddlers might want to portage around. Below the Highway 434 Access Site is the most popular floating stretch of the Dearborn, lasting nineteen miles to the confluence with the Missouri River. This should not be floated during late summer since this stretch of river can be severely low, requiring long drags of a boat across the gravel bottom. The best fly fishing for brown trout is also found along this stretch, particularly where several feeder creeks flow into the Dearborn River. Listed below are selected river miles on the Dearborn River, from its origin to its end at the confluence with the Missouri River.